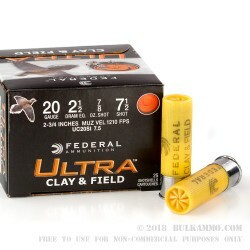 This 20 Gauge shotshell from Federal’s Ultra Clay & Field line of ammunition offers a solid plastic hull with an eight point crimp, sensitive and reliable primer, and clean burning propellant to help you excel wherever and whatever you like to shoot -- but all for an attractively low price. 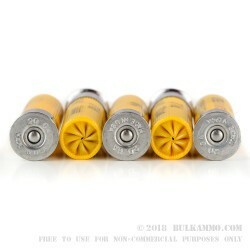 This shell is loaded with ⅞ ounces of #7.5 lead shot. The shot is hard and uniformly round, so it will resist deformation in your barrel until it exits the muzzle at a velocity of 1,210 fps, and then provide a tight pattern en route to your target. The just over 300 .095” diameter pellets are perfect for taking dove and pigeon at normal ranges, larger quail and partridge, woodcock, and squirrel as well. The shot’s size means it will effectively kill such small targets without rendering their trophies into something dreadful and unfit to take home with you.